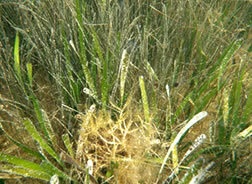 Seagrasses play a critical role in the coastal environment, serving as nursery habitat for estuarine fisheries and a major source of organic biomass for coastal food webs. Seagrasses help combat coastal erosion and sedimentation and act as major biological agents in nutrient cycling and water quality processes. It’s important to remember what’s under the waters when we’re out boating. CBBEP supports seagrass protection efforts through our ‘lift, drift, pole and troll’ campaign, asking boaters to prevent scarring the seagrasses with boat motors. Read more about the benefits of seagrass and see Texas Parks and Wildlife’s PSA here..
For more information from the Texas Parks and Wildlife on Seagrass click here.